Answer: Newspapers’ Broadway critics play a central role in both stories. In “Eve,” the oily Addison DeWitt is a columnist as powerful as a Winchell, shaping ambitious young star Eve’s career. In “Arsenic,” Mortimer Brewster’s profession as a reviewer — and his negative attitude toward current plays — become the excuse for several in-jokes about the theater, including a key scene that subjects him (bound and gagged) to a script-reading by a beat cop with literary aspirations. Straddling the dramatic world and the newspaper world, press critics and entertainment columnists were natural characters for film and radio scriptwriters to satirize or to use as go-betweens with the audience. In the U.S. Steel Hour Theater Guild production, DeWitt takes on a greater role as narrator of the story, perhaps becoming a more likeable character in the process. What do you think? His self-described “contempt for humanity and insatiable ambition” may get in the way. To those of you who do not read, attend the Theater, listen to uncensored radio programs or know anything of the world in which we live – it is perhaps necessary to introduce myself. My name is Addison DeWitt. The power of the critic: Addison gets an audition for a protege by promising to plug the producer’s work. When Eve upstages the protege, he switches teams. His self-importance: “I am somebody,” he informs Eve Harrington, before writing the column that launches her career. The critic as investigative reporter: It’s a “spoiler” if you haven’t seen the film, but DeWitt is the one who uncovers Eve’s real story. It would be a headline sensation, but he doesn’t print it — and not out of a great spirit of ethics. True to himself alone, he ultimately uses the knowledge to gain control of Eve’s career. The Oscar-winning film All About Eve starred Bette Davis as Margo Channing, Anne Baxter as Eve Harrington and George Sanders as DeWitt, with Celeste Holm as Margo’s friend Karen. 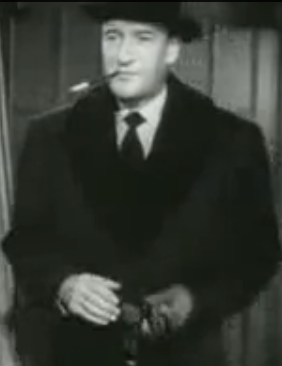 Davis and Baxter appear in the Lux version, with Reginald Gardner as DeWitt. Alan Hewitt was DeWitt and narrated the Theater Guild version. It starred Tallulah Bankhead as a much more over-the-top comedic Margo and Beatrice Pearson as Eve. Mary Orr, author of the original short story, “The Wisdom of Eve,” played the supporting role of Karen, the star’s friend who is manipulated by the up-and-coming Eve. According to several online sources, including Turner Classic Movies, Orr annoyed Bankhead by insisting that her story was not about any incident in Bankhead’s life, while Bankhead thought Davis’ performance was an imitation of her — which she hints about at the beginning of her radio performance. Speaking of online sources, if these bits of film and radio history have you curious about Broadway history, you’ll have noticed a reference to a playwright named Clyde Fitch (1865-1909), whom Margot Channing protests was “before my time,” here is Fitch’s bio at Wikipedia. This entry was posted in 1940s, 1950s, adaptations, columnists, critics, movies. Bookmark the permalink.